Affiliates - American Patriot Holdings, LLC. ​APH began working on its objective in 2016, to design an inland container vessel for domestic transportation to compete with trucking and rail. We studied and learned from the short comings of the many past attempts to move containers on the Marine Highway. APH clearly understood the “gift” we needed to exploit was the significant natural waterway system in the U.S. which unfortunately has operated in much the same way for over 70 years. The innovative and patented design, developed by Naviform Consulting and Research Ltd, is owned by American Patriot Holdings LLC (APH). The design includes two U.S. Patents, with additional patents pending in Europe and Asia. The first patent includes the Exoskeleton Hull Structure, which significantly reduces the lightship weight allowing for maximum container payload. The second patent includes the Minimal Wake Bow Structure which allows the vessel to transit upriver, against a 5 mph current, at speeds of 13 mph with essentially no wake. APH has entered into an Exclusive Licensing Agreement with Naviform for use and Sub-Licensing of these patents, which should have worldwide appeal. The "LINER" vessel, planned for Mississippi River service, could range from 595 ft to 625 ft in overall length, with a beam of 134 ft. The deadweight capacity will range from 13,700 to 15,500 long tons (depending on draft - 9 to 10 ft.) and have a TEU capacity of 2375. The LINER propulsion system consists of four (4) diesel generators (2880 KW ea. 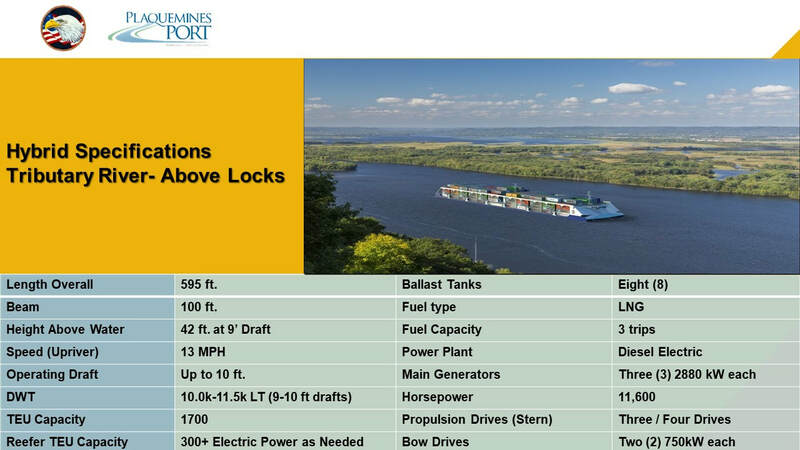 or 14,800 HP) driving four (4) main azimuthing drives and two (2) bow pumps, which will eliminate the need for docking and undocking tug assist without compromising safety. 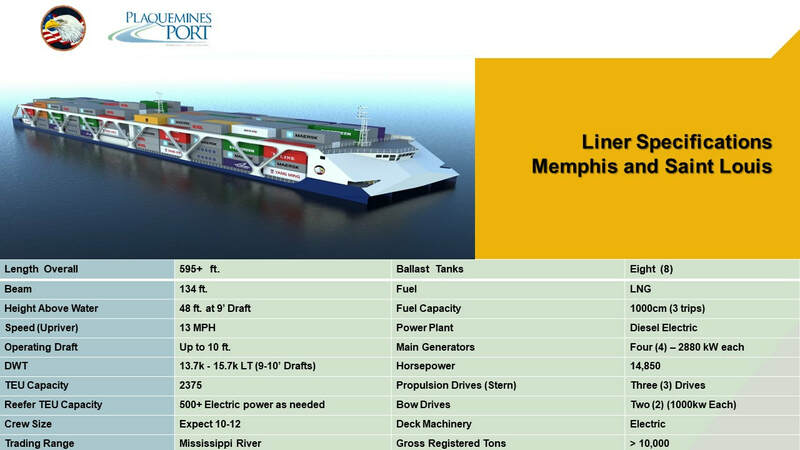 The "HYBRID" vessel, planned for the Mississippi tributary rivers, will be 595 ft. in overall length and 100 ft. in beam. The deadweight capacity will range from 10,000 to 11,500 long tons (depending on draft - 9 to 10 ft.) and have a TEU capacity of 1,700. These vessels will revolutionize inland marine transportation by giving shippers un-paralleled cost efficiencies and reliable service. The vessels will also offer shippers a “green” solution by utilizing LNG as the main propulsion fuel. The planned vessels on the Mississippi River / Tributary river system will run between a main container terminal in the port of Plaquemines LA., between mile 50 and 55, and numerous upriver ports. Focus cargoes for import and export will include dry goods, chemicals, agricultural products, refrigerated and frozen foods. In October 2015, American Patriot Bulk Transport LLC (APBT), conducted model testing in Potsdam Germany of the ATB Hull Form created by Naviform Consulting and Research Ltd. 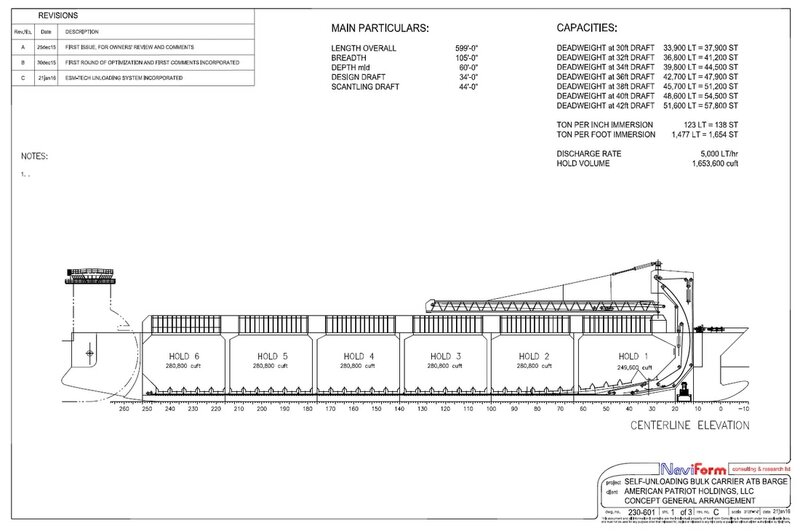 The ATB design, owned by American Patriot Holdings LLC (APH), is planned to be built as a dry bulk carrier utilizing the tug design and the barge hull form modified for dry bulk cargoes and self-unloading equipment with cargo capacity between 40,000 - 50,000 DWT, depending on charterers final requirements. The vessel will be dual fuel (LNG and MGO) and capable of underway transit speeds greater than 13 knots in a sea state up to 5. The planned design includes a diesel electric plant consisting of four (4) Diesel generators (2880 KW ea.) driving two (2) main azimuthing drives and a bow pump, allowing the vessel to safely dock and un-dock under its own power without the need for assist tugs. The design has a patented bow structure which contributes to the vessels speed by dampening pitch, and significantly dampens the relative motion between the barge and the tug. The relative motion reduction of more than 50% is a major benefit in reducing crew fatigue. The vessel will be geared with discharge capacity from the latest technology in self-unloading equipment with a minimum discharge capacity of up to 5,000 MT per hour. The design also includes built in washing capacity to facilitate cargo changes. This State of the Art hull design is expected to service existing customers relying on efficient transportation of fertilizer, coal and pet coke, as well as new customers with significant demand for solid fuel transportation commencing in early 2021. In October 2015 Marine Petrochemical Transport LLC (MPT), conducted model testing of the ATB design created by Naviform Consulting and Research Ltd, in Potsdam Germany. The ATB design, which is owned by American Patriot Holdings LLC (APH), will have application for liquid Oil and Chemical transport, and includes up to ten segregations. The 210,000 Barrel vessel will be outfitted with stainless steel or epoxy coated tanks, or a combination of both, and will transit at speeds greater than 13 knots in a sea state up to 5. The planned design includes a diesel electric plant consisting of four (4) diesel generators (2880 kw ea) driving two (2) main azimuthing drives and a bow pump, and will be able to dock and undock under its own power without the need for assist tugs. The design has a patented bow configuration which contributes to the vessels speed but also significantly dampens the relative motion between the barge and the tug. The relative motion reduction of 50% is a major benefit in reducing crew fatigue. The same ATB hull design is also planned to be built as a dry bulk carrier with cargo capacity up to 50,000 DWT.